Looking for healthy food options in the mall is not always easy. 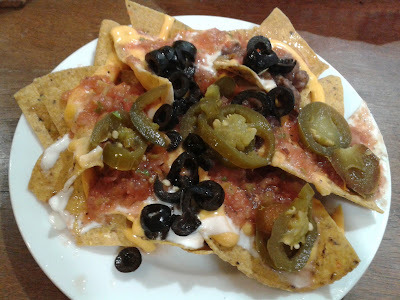 Luckily, there are establishments that do offer vegetarian options of favorite food treats like nachos. Mexicali is one such restaurant. Although the vegetarian choices are not that many, you can go here for a quick snack or a hefty lunch or dinner. Nachos are one of my favorite go-to foods usually for snacks or dinner. 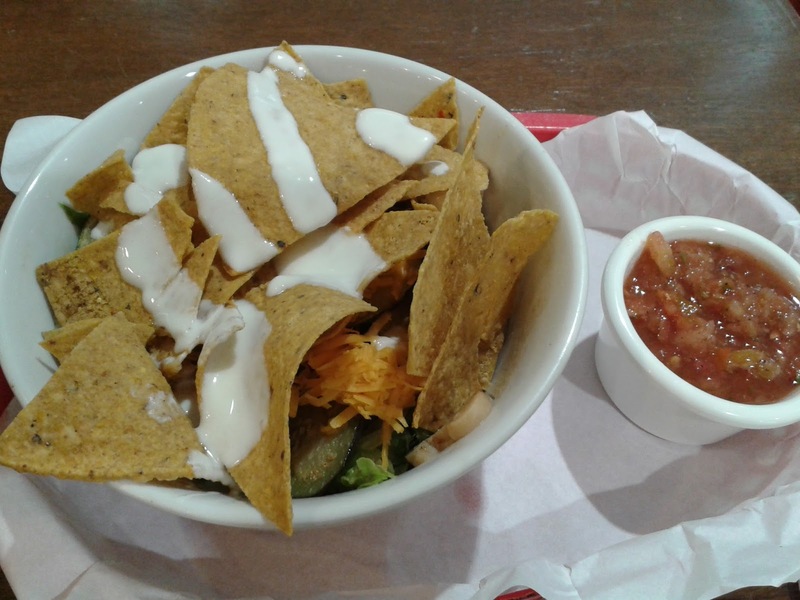 But while I was going around in a mall, I found myself craving for nachos in the middle of the day. I looked around for a potential lunch place and found Mexicali. I knew they had some vegetarian options and nachos so it was the perfect option at the time. 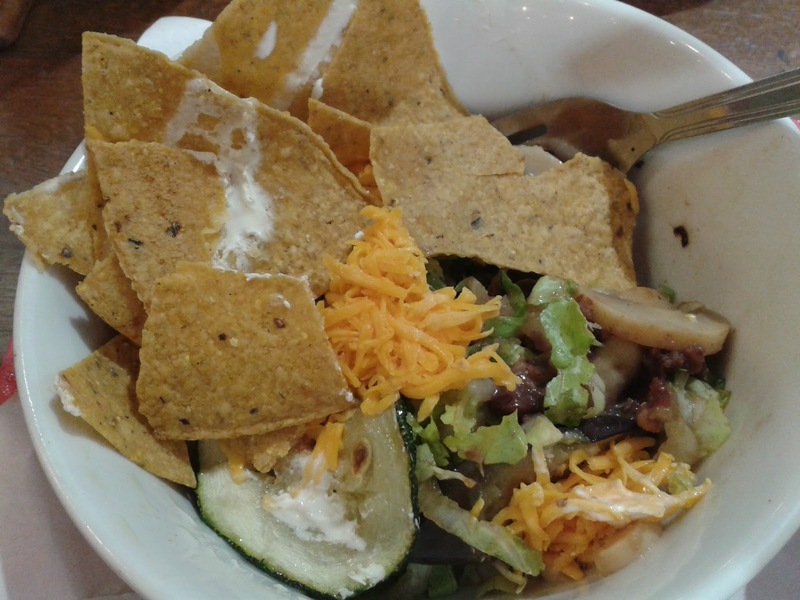 Apparently, hunger can make you overestimate how hungry you really are so I ended up ordering a nacho salad, because it was vegetarian and of course the regular vegetarian nachos. When my order was delivered to me, I realized how hefty a lunch I had before me. I ate it all though and just walked around some more to burn some of it off. Now let's get down to how yummy the nacho dishes were. Nachos Salad with Salsa Dip on the side. These had a lot of nachos on top of the veggies and the cheese. I took out some of the nachos so I could take a peek at what types of veggies were underneath. There was cucumber, red and black beans, mushrooms, peppers and cabbage among others. All roasted and soft and yummy when I got a taste. The salsa dip just added a layer of freshness to the whole ensemble. Next was the regular nachos without the meat. 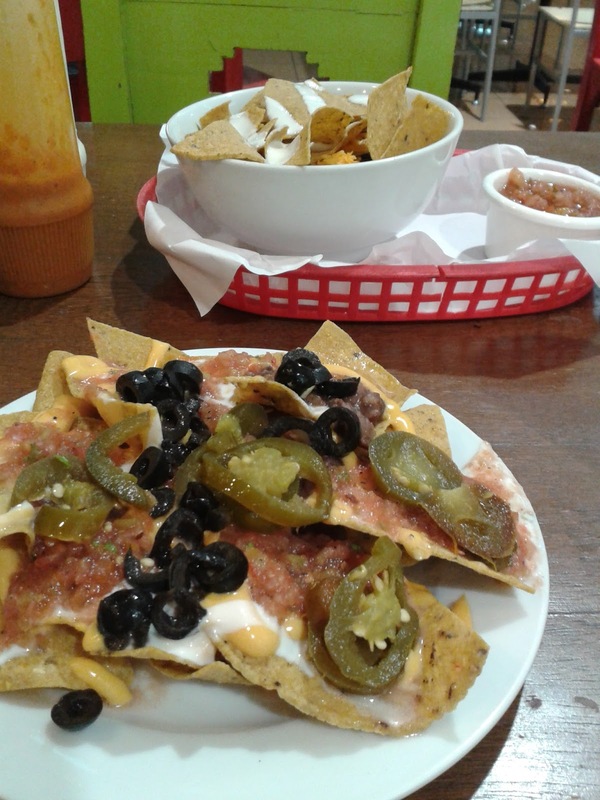 After the salad, I knew I was near full but I just couldn't resist nachos especially when they have black olives. I made the mistake of forgetting to pick out the jalapeno slices and thought I had burned my whole mouth after the first bite. A second mistake I made, was to squirt what I thought of as garlic sauce, unto the nacho I was eating to cool of my burning tongue. Turns out the white sauce was not garlic sauce. I don't know what it was but it was also hot and so I just ended up doubling the torture on my tongue. Thank goodness I had asked for water so a long, big gulp gave me some relief. Still, I was able to enjoy the crunchy nachos with the creamy and salty, tangy toppings. I left the jalapenos on the side so I could enjoy the rest of the yumminess. I had a full tummy after this and I had to endure the burning sensation in my mouth for quite a bit. However, this was a delicious treat as a snack or as a meal. I will order these 2 again but separately, the next time I need my nacho fix. P.S. The spiciness must have made me lose some brain cells in the process because I completely forgot how much these treats cost. You can always check out their big menu displayed in front of their resto if you ever decide to pass by for some nachos.